An air strike is called in the explosive game, Worms 2: Armageddon. “Angry Birds” has been a massive success since the moment it was first released for iPhone, and Android devices — so much so that it has kind of made it impossible for other games in its genre of turn-based artillery games to get any attention. This doesn’t mean that there are not better games out there. “Worms 2” is one of those neglected games. “Worms 2: Armageddon” is a great game. As the name suggests, it is a sequel. Team17, the small game studio that produced “Worms 2” released the first “Worms” in 1995. That is an eternity in the video game industry. In 1995 the Internet was just becoming truly mainstream and smartphones didn’t even exist. 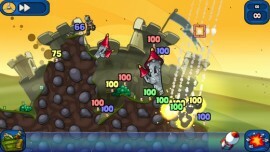 Since then, Team17 has released a multitude of “Worms” games for different platforms, at least 20 titles at last count. This means they have had a ton of time to refine the genre. “Worms” games are always fun to play. The basic mechanics are like “Angry Birds” in that the game is 2D and you shoot something and try to hit something else, and there are cute characters involved. “Worms 2” brings a lot more depth to the basic concept. The worms in “Worms 2” have a multitude of weapons and powerups that make games like this fun. The ability to create a team of worms and customize the gameplay sets the game apart. Each player can customize the look and feel of a team of worms, and play single-player levels or play in multi-player networked games, or in hotseat mode with friends on a single phone or tablet. This game is a great addition to a long series of solid games. The release of a “Worms” game on smartphones mean “Worms” is finally available on the platform that makes the most sense for a silly fast-paced game you can play with other people. Send all Application Station ideas to the Pioneer editor at editor@occc.edu.